Class is like traveling into a new world everytime you step into Madame Hutchison's room. Madame Hutchison is my French teacher. It has been about two and a half months, and I already know how to speak and understand a little bit of . In our classroom, most of the time we do Rosetta Stone. Rosetta Stone is a program that teaches you different languages in about a year. The millatary and the government uses it. It is suposed to be a very good program. We are currently learning a part of a french song. It is called "I am a Pizza", by Charlotte Diamond. It sounds like a toddler song, but there is a part in French that is pretty hard to say. We learn songs in our class, because it helps you reconize and understand French words much more easier. Sometimes I feel silly singing this song, but I know that it will only help me learn more. Here is the part that we have to learn. I learned a whole bunch of new french words. Rosetta Stone, the program, helped me recongnize some of these words, like the word "manger", which means eat. I also use context clues to help me figure out some of the meanings of the words. I know that "Je" means "I", so the top sentence would be " I am a pizza". The connection that I made was with Rosetta Stone. It really helped me find what some of these words mean. Rosetta helped me practice some words by telling me how to pronounce them and how to spell them. Rosetta Stone also uses the word in a sentebce, so that I can see and hear how the word is pronounced. I really like Rosetta Stone, becuse I learned more than I used to before I took up the program. The tool that we use for Rosetta Stone is headset with a microphone. Rosetta Stone has some things that it lets you pronounce,to make sure you know how to say it, and you use the headset to hear how it is pronounced. I have also relized that the more you say and hear a language the more your brain starts to reconized it. That for me is the best way to learn and understand a new language. 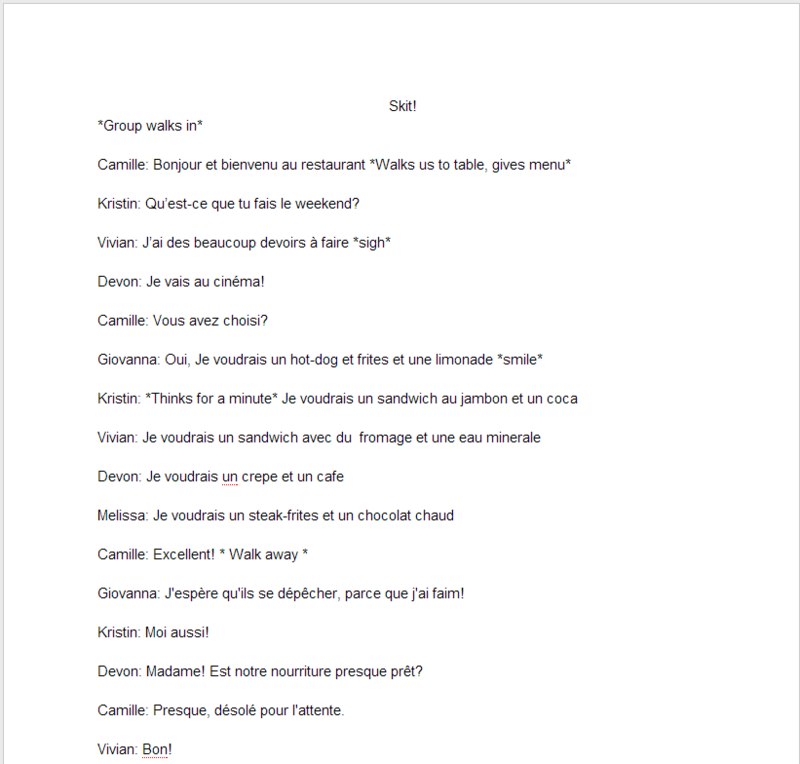 This is a skit that my table group had to make up and act out for my French class. It was easy, because all you had to do was makeup a story. The hard part was probably acting it. Were all pretty nervous. This is a skit about a group going to a restaurant and ordering food. As you can see, all of the lines are in French, but the words in astrieks aren't. 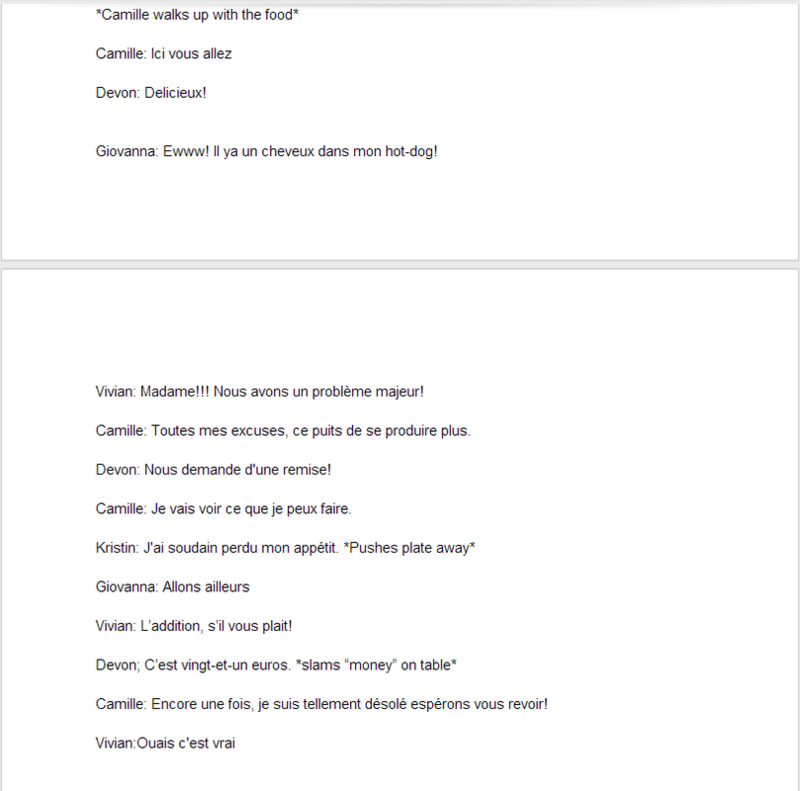 Some tools that we had used for this skit are our packet that has a lot of French words, and Google Translate. You should try making a skit in another language as well! It is a lot of fun. The best part about making this skit was acting it out. Although it was nervewreking to go and preform it, it was really fun. In the skit, there is supposed to be a problem. The problem is that a customer ordered a hot-dog, but it has a hair. She tells the waitress and the waitress takes care of it. If you can not read French, just write it in Google Translate. It is easier that way!